CALL (508-787-9796) or email (rp@rockpeddler.com) before you order to ask about current availability of the Graves Mark 5XL. Graves Company is proud to introduce the Mark 5XL Faceting Machine featuring our digital angle display meter. 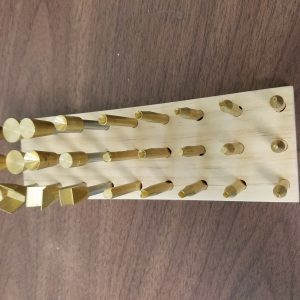 This revolutionary design allows users to truly “cut to the numbers” utilizing a simple digital display that is stable, repeatable, and accurate. 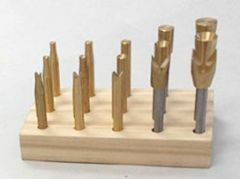 The Graves Mark 5XL faceting head features simplicity in design, ease of use, and state of the art precision that is beyond anything on the market today. This design has been extensively field tested by actual faceters, both amateur and professional. 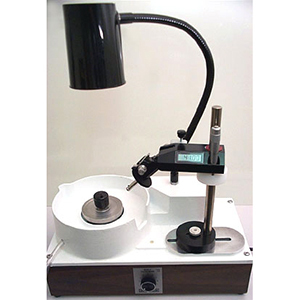 The Mark 5XL faceting head features an electronic angle scale that is repeatable to better than .02 degrees, calibrated 0-90 degrees to 2 arc-minutes (+/-.03 degrees). Precision laboratory grade electronics are used throughout the design. In cutting tests, it has approximately ten times the sensitivity of an LED “Down Light”, and allows cutting “To the Numbers”. This method of faceting allows you set your angle, index setting and depth, then simply let the easy to read digital display tell you when to stop cutting. A little practice and you will be amazed at how easy and fast you can finish a beautiful faceted gemstone. 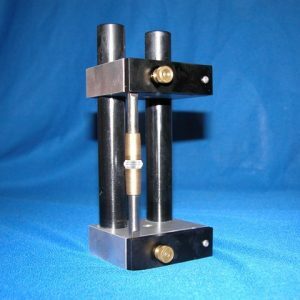 A ¾ inch case hardened stainless steel mast provides rigidity to avoid over cutting due to mast deflection. The coarse height adjustment collar will not drop when loosened and provides a fast setting. 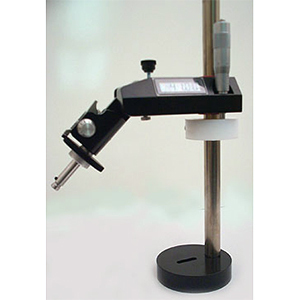 The fine height adjustment is a 1 inch micrometer head with .001″ increment marking. A solid aluminum quill and main housing with precision ball bearings to support the quill and angle shaft, and a durable powder coat finish complete the design. A 9 volt battery powers the electronics providing up to 250 hours of cutting time. No wires or power supplies to get in the way. We are proud of this new addition to our product line. 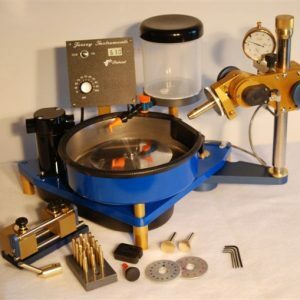 Graves Company continues to be the leader in providing durable, innovative, and affordable tools to the lapidary arts. 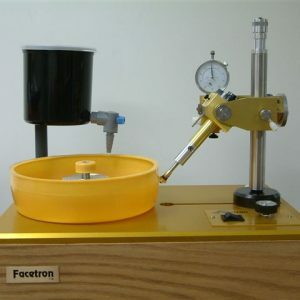 Facetron Faceting Machine: A 96 gear is mounted on the machine.